Happy St. Patrick's Day! 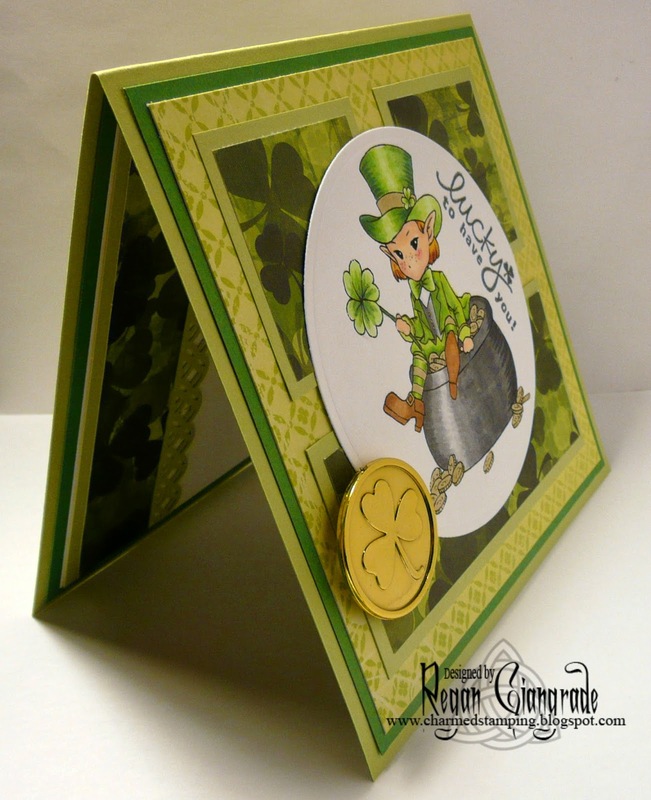 Everyone's a little Irish today so I thought I'd share the two cards I made. The first one was for my co-worker. She actually IS Irish and she loves this holiday so, like last year, I decided to make her a card. I am so excited that I finally got to color up an image from Stamps by Aurora Wings! If you haven't heard about Mitzi Sato-Wiuff then you may have been living under a rock! lol These gorgeous images are taking the craft world by storm and I am swept up in the tempest! Her etsy shop is filled with flowers and magic! She also has a website, a blog, a brand new challenge blog, and a Facebook group! This is Clover Pixie and she is colored with Copics. I must say I am really pleased with how she came out! I cut the image out using the Small Deckled Rectangles Nestabilities from Spellbinders. The circle behind her is also from Spellbinders, a set called Celtic Motifs (a $10 score from AC Moore). 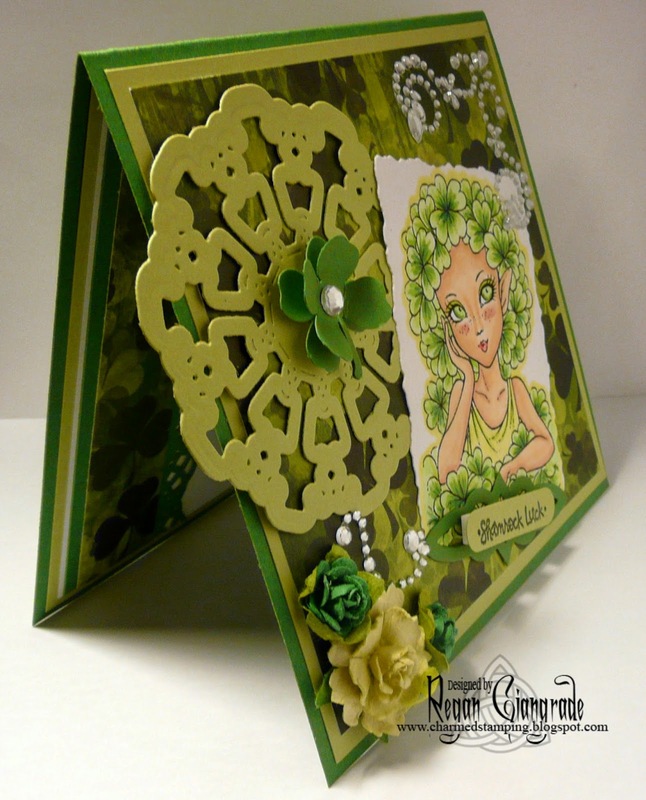 The paper is Shamrocks from Karen Foster Design. I added a bit of bling, some flowers, and a Martha Stewart punched four leaf clover. The sentiment is from one of those little Studio G sets and I used a Stampin' Up punch for it. Notice my fabulous new watermark? My friend Michelle of Evermore Card Creations is a-freakin-mazing! Not only did she give my blog a much needed makeover, but she created the perfect watermark for the photos of my creations! She's a digital goddess but she also knows her way around Copics and paper! Check out her etsy shop HERE! Okay, now that the shameless plug for my friend is over, let me tell you about the second card I made. This one was for Kayne. St.Patrick's Day just happens to be his "half" birthday, which I think is pretty cool, so I always acknowledge it with a little something- a card, baked goods. And I am so enthralled with Stamps by Aurora Wings that I colored a second image! This is Leprechaun. Isn't he cute? I thought he was perfect for my small man! So I colored him up with Copics and cut him out using the Classic Circles Nestabilities from Spellbinders. 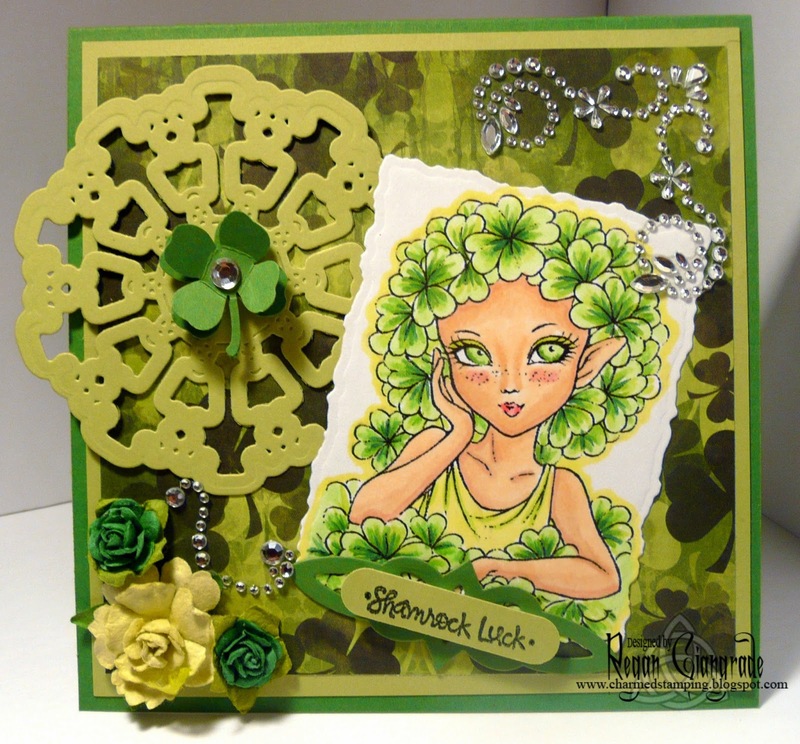 Papers are Karen Foster Design - Shamrocks and Little Yellow Bicylce - Lucky Me Flourish. Since this one is for a preschooler, I kept it simple. I stamped another Studio G sentiment directly onto my image panel and added one plastic "gold" coin. Oh my gosh, those were so much fun that I just want to sit back down at my craft desk again and color! And I'm sure I will soon. Just not tonight. Thanks for stopping by! 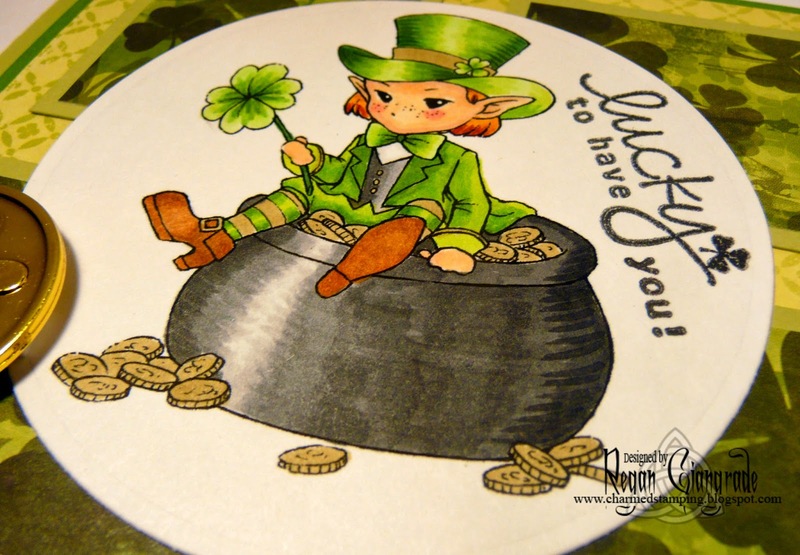 May your luck be plenty and your troubles be few! I'll leave you with a photo of my little leprechaun! - Clover Pixie: Copics (E00, E11, E21, R32, R35, G29, YG00, YG03, YG11, YG17, YG67). - Leprechaun: Copics (E00, E11, E15, E19, E21, E34, E37, E39, R32, N0, N2, N4, 6, N8, Y28, YR24, G29, YG03, YG11, YG17, YG67). Two lovely cards, but my favourite is the first one, I'm sure your friend loves it, your colouring is superb. 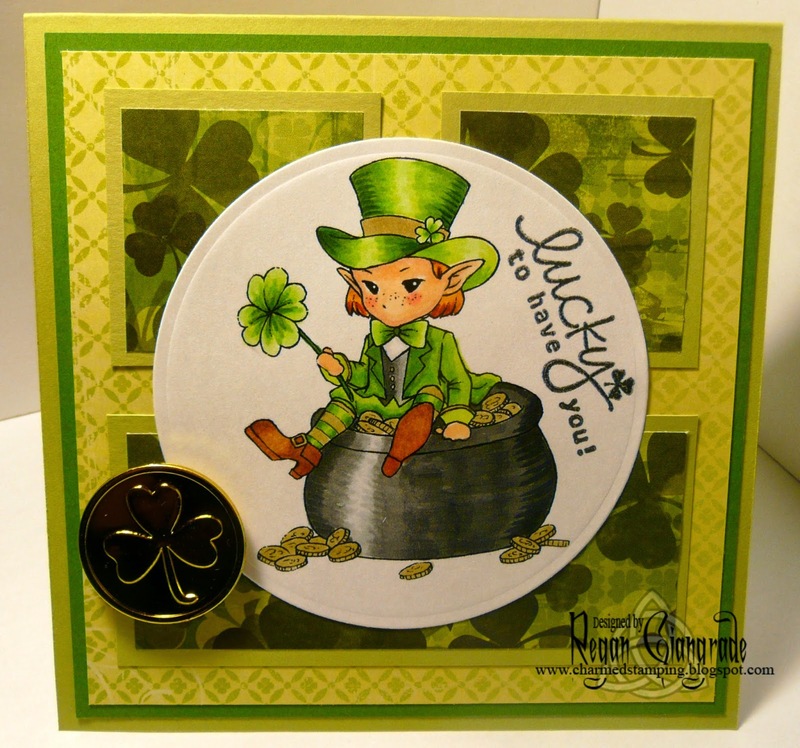 Your little leprechaun is adorable and the cards are cute too :) Love your shamrocks and the leprechaun card is wonderful as well. Thanks for playing along with us at Bunny Zoe's Crafts. Gorgeous cards, all of them. 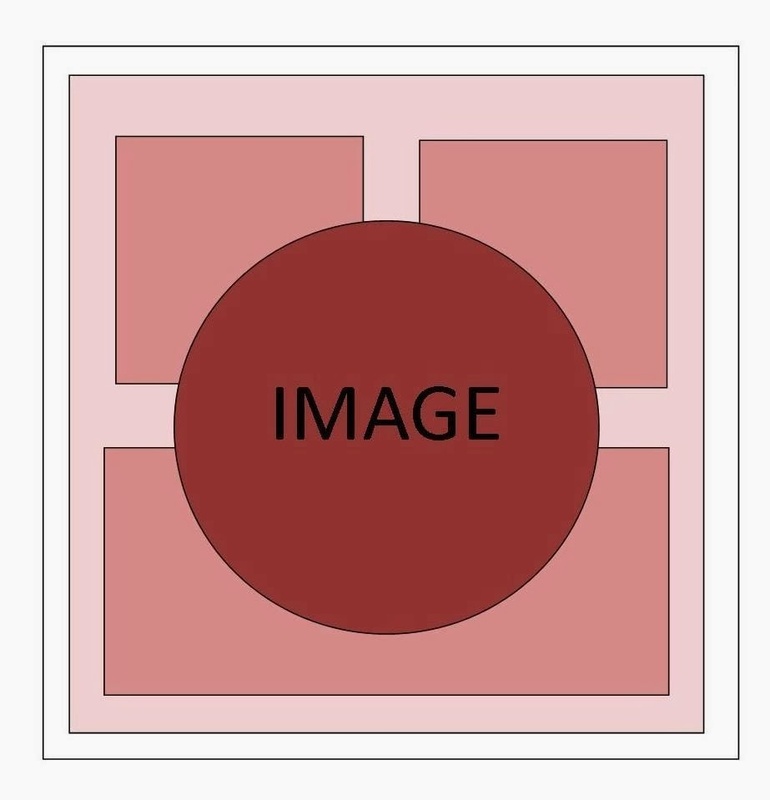 I love the images you have used and love the photo of Kayne. He is so cute! 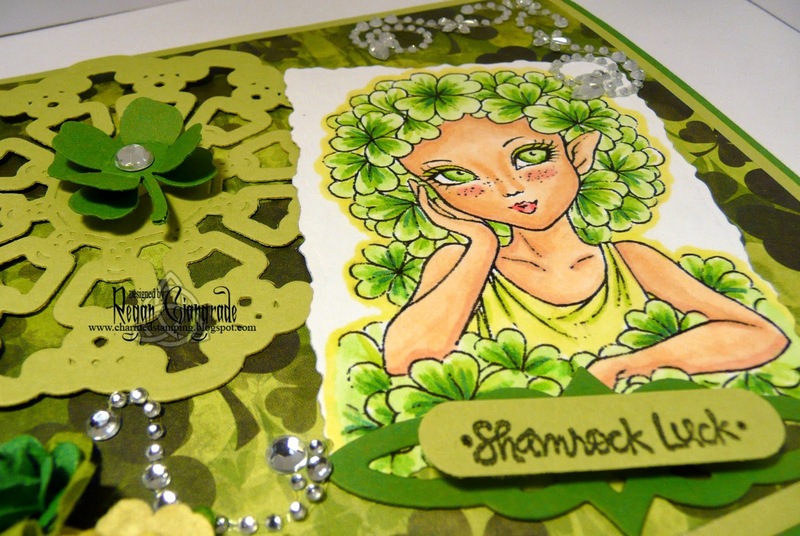 What lovely cards and your own little leprechaun is sooooo cute too. I love the images on both cards and how you've embellished each one. Great job. I adore both of your cards. The coloring is fantastic, but I must say the shamrock one is striking. Thank you for creating with us at UYS. Fabulous job on both cards, sweet images & wonderful design! OMG and your sweet leprechaun is adorable! 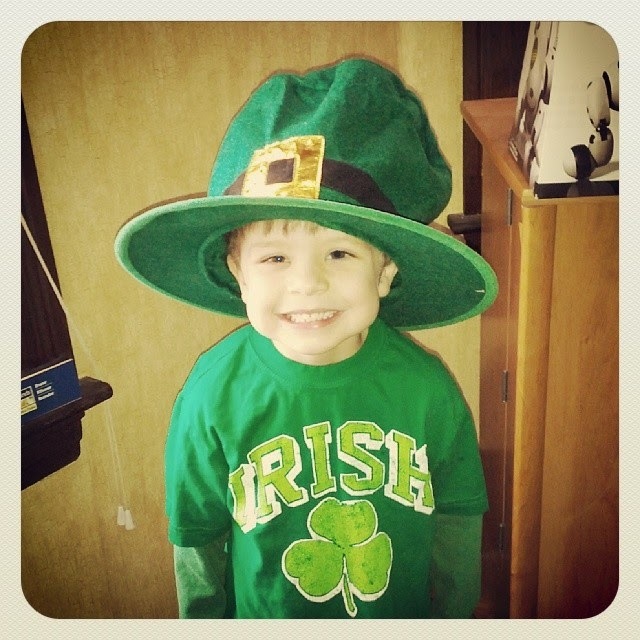 Your leprechaun is so cute ! Beautiful cards too with such a beautiful coloring ! Love how dimensional they are. Thanks for playing along with us at Use Your Stuff ! Two lovely cards i especially like the first one....so well made.....excellent. Love, Love, Love the shades of green, and it is always great to see embellishments off the edge. So beautiful. Thank you for joining TTPH this week. Thank you for participating in this week's OSAAT Challenge! Both of these cards are adorable, and so is the little guy. I personally love the leprechaun. Thanks for sharing with us at Come and Get It. Hi Regan, You've got some lovely cards there and wanted to thank you for joining us at Come And Get It for the Challenge! But of course the Aurora image is fabulous! LOVE BOTH of your cards! BUT the little leprechaun is my fave...he is SO cute with an irresistable smile! Thanks so much for joining us this week at Come and Get It Challenges! Your colouring of these sweet images is gorgeous. Not only that, but your card designs show them off so well with gorgeous layering of pretty papers and wonderful choices of embellies. Your last "make", the little Irish cutie, is my absolute fave...sweet photo. Thanks for joining our Go Green Challenge this week at Craft Your Passion Challenges. I hope we see you again soon. Wooo.. this is just amazing! Thanks for joining at Kaboodle Doodles! My, what Gorgeous green creations you have made! Love them both. Thanks for joining us at Aurora Wings.